I’m drawn to stories of midwives, both real and fictional. They appeal to my reverence for pregnancy and birth, and the passionate feelings I have about home birth and midwifery. Patricia Harman worked as a direct entry home birth midwife for many years before becoming a nurse midwife who helped women deliver their babies in hospital and birth center settings. 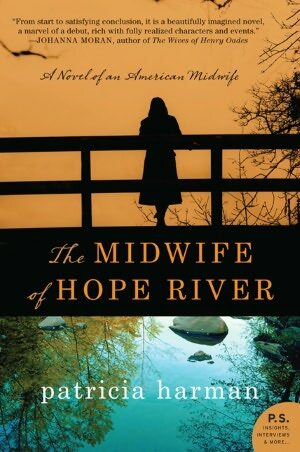 Her first book, a memoir, The Blue Cotton Gown: A Midwife’s Memoir (which I have not read) was published in 2008; this is her third book, and her first novel. In it, Harman tells the story of Patience Murphy, a woman who stumbled into midwifery quite by accident. Patience – whose real name is Elizabeth, but she goes by the pseudonym – has been on the run from her past and the law for almost as long as she can remember. She never intended to wind up living on the outskirts of Liberty, West Virginia, delivering babies, but she’s become accustomed to the twists and turns that life has doled out to her. Spunky and smart-alecky on the surface, inside she holds grief powerful enough to destroy her if she lets it. Set during the Depression, Patience risks her life by openly befriending and living with a young black woman, putting her on the local KKK’s most wanted list. There are joyous depictions of birth in this story, as well as stories tragic enough to make it all feel very realistic. As the saying goes, I laughed and I cried – numerous times. When Patience meets the town’s veterinarian, what eventually occurs is somewhat predictable: a very sweet romance that fortunately doesn’t overtake the story. How authors choose to end their novels is always intriguing to me. Some wrap things up neatly, and others, like Harman in this novel, leave the ending open for the reader to imagine for themselves. That’s a special talent, I think. I really enjoyed this book and was sorry when I closed it after reading the last page. I adored this book and really didn’t want it to end. I too am drawn to books/stories about midwives, which is kind of funny because that’s just NOT my thing (absolutely no judgment there either, I love that some people prefer midwives and home births and I think they fill a really valuable role, it’s just not for me). I’ve read this author’s memoirs and liked them too. Have you watched Call the Midwife? It’s about a group of midwives working in POOR London in the ’50s (I think?) It’s so good, I highly recommend. Jaida, I haven’t seen it, although its been recommended to me by a number of people. I did read the book it’s based on though, a number of years ago – it’s now called “Call the Midwife” I believe, but when I read it, it was just titled “The Midwife.” Anyway, it was very, very good – I loved it. Thanks for the comment, Patsy! I really enjoyed your book. I have seven kids, and the last three were born at home with a midwife 🙂 I have never seen Call the Midwife, as I don’t watch much TV, but I did read the first book by Jennifer Worth that it’s based on long before it became a hit TV show. Maybe your book will make it to the big screen!